On its release in 2015, Jim Beam Apple followed up on the bourbon whiskey's success with flavors like Honey, Kentucky Fire, Maple, and Red Stag (Vanilla has since been added). While it will not have the universal appeal of their signature Kentucky straight bourbon, this flavored whiskey has developed a very loyal following. And, as apple-flavored whiskey goes, it's pretty good! What Is Jim Beam Apple? Flavored whiskey cannot technically be called "bourbon" because the added flavoring does not meet the regulations that define the style of whiskey. It doesn't matter how the flavor is added to the whiskey (e.g., infused or blended), either. Jim Beam Apple is made by blending an apple liqueur with Jim Beam Bourbon. As is clearly stated on the label, this is indeed an apple liqueur. It is bottled at 35 percent ABV (70 proof), making it one of the stronger apple liqueurs on the market. 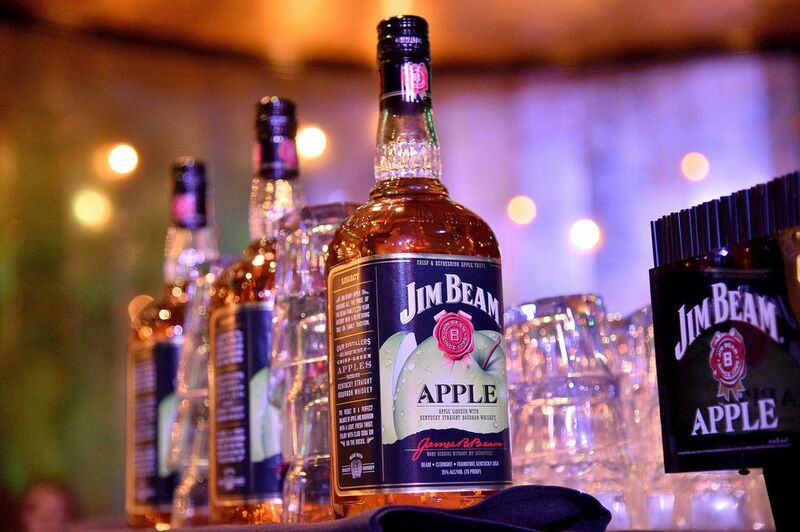 Jim Beam Apple has the very sweet taste of green apples. The level of sweetness is definitely reminiscent of liqueur and this is notably one of the sweeter flavored whiskeys that Jim Beam has produced. The fragrance is the most notable trademark of Jim Beam Apple. While Red Stag and Kentucky Fire both emit a strong aroma, the scent that escapes the Apple bottle when it is first cracked is unforgettable. Don't even think that you can sneak a sip of this whiskey because the entire building will know what you are up to! The apple character is far too strong to really enjoy the bourbon because it is simply overwhelming. It's as if a Jolly Rancher factory dedicated to producing only the green apple candies exploded in the room. In all fairness, once you get beyond the smell, you can get a fair taste of the whiskey. It is quite enjoyable, especially when compared to other sweetened apple spirits. While the likes of Apple Pucker are not personal favorites, it's not difficult to see how drinkers who do like those are really going to enjoy Jim Beam Apple. The bourbon base is a much-needed improvement on the majority of apple liqueurs. It gives a depth to the flavor and a dark oak undertone that offsets the sweet, green apples, making it more drinkable, less sour, and better balanced. This is a flavored whiskey that needs to be mixed into drinks. Sure, you could shoot it and have a lot of fun, and many fans have found it to be really enjoyable when served on the rocks. But, if you want a good, lasting drink, it's best to add other ingredients. The price is competitive at under $20 and you shouldn't hesitate to use Jim Beam Apple in any mixed drink that calls for apple schnapps or liqueur. In fact, this may be a significant improvement over many of the other options available. It will not give you the green color of its apple competitors, but it does work well in an appletini. It could also be paired with a Canadian whisky as a substitute for the schnapps in the popular Washington apple in either cocktail or shooter form. You may even consider it as a replacement for the vodka in (what else?) the Jolly Rancher. One of the recommended drinks, the Jim Beam Apple and Soda (as simple as a shot of the whiskey topped with club soda on the rocks) is good. Try adding tonic because the dry soda offsets the sweet liqueur quite nicely. Yet another option is to use Jim Beam Apple as the apple whiskey in the handful of classic cocktails that feature the ingredient. Since these recipes were not intended for a sweet whiskey liqueur, you will want to make some adaptations—primarily cutting back on any sweetener—to ensure the drink has a nice balance. It's not perfect and certainly wouldn't be authentic, but there is potential. Bottom line: If you are an apple fan, give Jim Beam Apple a chance because the odds are good you may be pleasantly surprised by the flavor.